A few weeks ago my niece, who is almost four, saw Frozen. 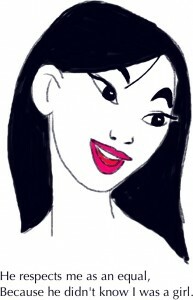 It was her first movie in a theater and her first official Disney movie. She’s seen Studio Ghibli and Pixar movies on DVD, which are both associated with Disney, but are creatively independent of the Mouse. And of course she’s seen the princesses. Not the movies, just the princesses. She has seen princess dolls and sunglasses and bedsheets. She’s familiar with their looks and their names, but she has a very vague idea of their stories. As far as she’s concerned they fight bad guys and save their friends. Just like any super hero. I hope it stays that way for a long time. 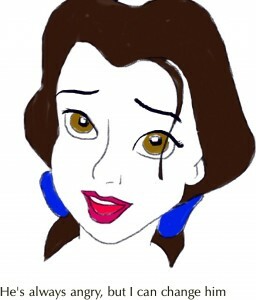 I have mixed feelings about Disney, particularly the princesses. I loved them as a kid and watched the movies repeatedly. I enjoyed the wish fulfillment aspect of wearing fancy dresses and living in a palace and being undeniably important. (I still kinda want a tiara sometimes). But my wish fulfillment fantasies weren’t limited to princesses. I wanted to be a rock star and an astronaut and shortstop for the White Sox too. For me one of the biggest appeals of animated fairy tales (or any fairy tales in fact) is because they gave me a magic fix. I was a kid that believed wholeheartedly in magic. I ate it up. It’s no coincidence that my favorite of the original batch of princess movies is Sleeping Beauty, which has a dragon. A very scary dragon! It’s also a complete rehash of the two princess films that came before it, using Snow White’s basic plot, while weaving in hallmarks of Cinderella. Not one but three fair godmothers, and using the same actress who voiced the stepmother as Malificent. It’s also the one where the princess in question has the least amount of screen time or personality to speak of. I was equally as enamored with the second wave starting with the Little Mermaid. I own most of them. Because they held such a special place in my little kid heart. But But But BUT! As an adult they can be tough to watch. Not just because of the squeaky mice. It’s hard not to notice the screwed up messages about gender roles and romance in almost all of them. My perspective has changed. I haven’t seen Frozen yet. From what I hear it manages to sidestep or subvert the worst of the princess pitfalls. And I really enjoyed Tangled a few years ago. I’m glad Disney is course correcting going forward. But they’re still profiting off the back catalog. The problematic princesses aren’t going anywhere. 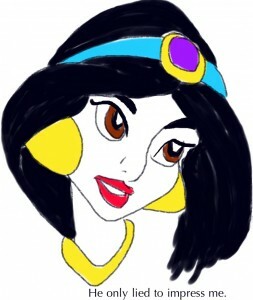 This entry was posted in drawings, movie, Uncategorized and tagged commentary, Disney, oy vey, Princesses by Susie. Bookmark the permalink. She is very lucky to have an aunt like you to influence her tastes as she grows. 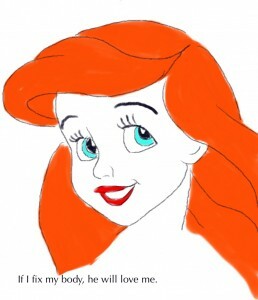 Kudos to you for grappling with the princesses! As an outspoken feminist adult, I tend towards the completely dismissive (on a good day) of the princesses. 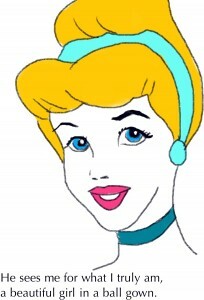 But truth be told, I loved Cinderella as a kid. There was that wonderful magic fix for a girl who was sensitive and misunderstood, which I totally identified with. Florence is right- your niece is very lucky to have an aunt who understands magic, and can still be critical. I’ve kept a lot of the old Disney movies from my daughter for exactly these messages that already feel all too easy for girls to pick up anyway. She has seen Beauty and Beast because Belle is the best of the old princesses. She’s at least active and brave and makes her own choices. I’m not actually sure if Brave and Tangled are Disney, but we own both of those. Maybe they’re filled with abhorrent messages too, but by comparison to Cinderella and Snow White, they’re feminist treasures.